Preparing for the holidays can leave little room for your love life. We have put together a basket that will help you keep your fires burning. 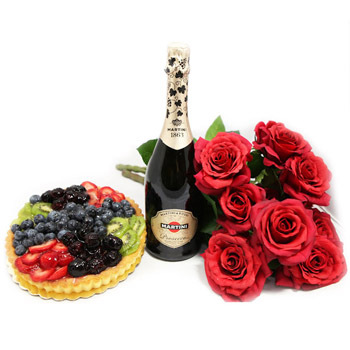 Your recipient will enjoy a bottle of Sparkling Wine (750 ml), delicious Fruit Cake (1 kg), and 7 Roses of color of your choice (65-70cm) to set the mood. Say I Love You, end a night of gift shopping, or celebrate and Anniversary with My Sweet.